This article is Part 2 in a two-part series on concerns with Polyunsaturated Vegetable Oils.Part 1 can be read here. There are a few key things about polyunsaturates vegetable oils that need to be understood to understand this article, so I’ll keep the science simple. There are two class of polyunsaturated fats; (PUFAs); omega 3 (ω-3 also written n-3) and omega 6 (ω-6 / n-6) which compete with each other for enzymes, and which becomes significant at one branch point (marked with the red and green box). At that junction point (where the red box is at Arachidonic acid and green box is at Eicosapentanoic acid) if there is more n-6 fats than n-3 fats, then the pathway will favour the n-6 pathway. If there are more n-3 fats than n-6 fats, then the pathway will favour the n-3 pathway. The issue, as I will elaborate on below, is that in the Western diet, the n-6 pathway is always favoured. Of significance, the n-6 polyunsaturated fats are pro-inflammatory and the n-3 polyunsaturated fats are anti-inflammatory. This is important to understand why eating lots of foods high in n-6 fats can lead to health consequences. When people take low-dose Aspirin® for example, to lower the risk of heart attack or stroke, it acts on Arachidonic acid in the n-6 polyunsaturated fat pathway, to keep it from making certain inflammatory products that can lead to heart attack or stroke. In our evolutionary history it was thought that n-6 fats (from nuts and seeds that were gathered in the wild) and n-3 fats (from the fish and meat we hunted) were eaten in close to a 1:1 ratio – providing the two essential fatty acids from both classes. When man began domesticating grain and growing beans and lentils and nuts and seeds for food (all high in n-6 fats), the shift towards a diet higher in n-6 fats occurred. The modern Western diet is estimated to have an omega-6 to omega-3 fatty acids of 15–20:1 in favour of n-6 fats . Many people take omega-3 fish oil capsules in an effort to protect their body from inflammation, but because the amount of n-6 fats in the diet is so much higher than the amount of n-3 fats, the n-6 pathway is still favoured. Unless we significantly lower the amount of n-6 fats in the diet, taking fish oil doesn’t really help as the n-6 pathway will always be favoured. Industrial seed oils have very high levels of linoleic acid which is at the top of the n-6 pathway. These industrial seed oils are pro-inflammatory and will elongate to Arachidonic acid, resulting in many pro-inflammatory products being produced. When we eat a lot of food made with soybean oil or fried in soybean oil we eat way more linoleic acid then our body has evolved to handle. A major problem with polyunsaturated fatty acids such as linoleic acid are that they are very unstable fats that are easily oxidized (similar to a fat becoming ‘rancid’ or a metal ‘rusting’). Even if we never buy these industrial seed oils to cook with at home, when we buy French fries at restaurants they are fried in either soybean or canola oil. When we pick up a donuts, same thing. Bottle salad dressing and mayonnaise (even the one that is called ‘olive oil mayonnaise’) are made with one of these industrial seed oils. These oils are found in products one would never expect to find them, including peanut butter! Start reading labels and you will be shocked how many products they are in – or rather, how few products they are NOT in. Industrial seed oils are in most of the prepared food we buy and almost all of the food we eat out in fast-food restaurants. When the linoleic acid content of the diet is high because we are eating foods made with industrial seed oils, important components of our cells membranes incorporate higher amount of linoleic acid into them. For example, cardiolipin is a phospholipid component found in the inner mitochondrial membrane, which is where all energy metabolism in our body occurs. Cardiolipin plays an important role in the function of several enzymes involved in mitochondrial energy metabolism. When we eat a lot of pre-made and processed foods and food made in fast-food restaurants, cardiolipin ‘s fatty acid content becomes 90% linoleic acid, making it easily oxidized, affecting its function. If the diet is high in coconut oil and olive oil, cardiolipin will be higher in stearic and oleic acids and these fats are more stable fats than linoleic acid. Literally, we are what we eat! When industrial seed oils are heated such as they are in the making of commercial foods using them, they undergo rapid oxidation which means that they react with oxygen in the air to form toxic substances, including aldehydes and lipid peroxides. Aldehydes are known neurotoxins and carcinogens, and are documented to contribute to DNA mutations, inflammation and hypersensitivity . 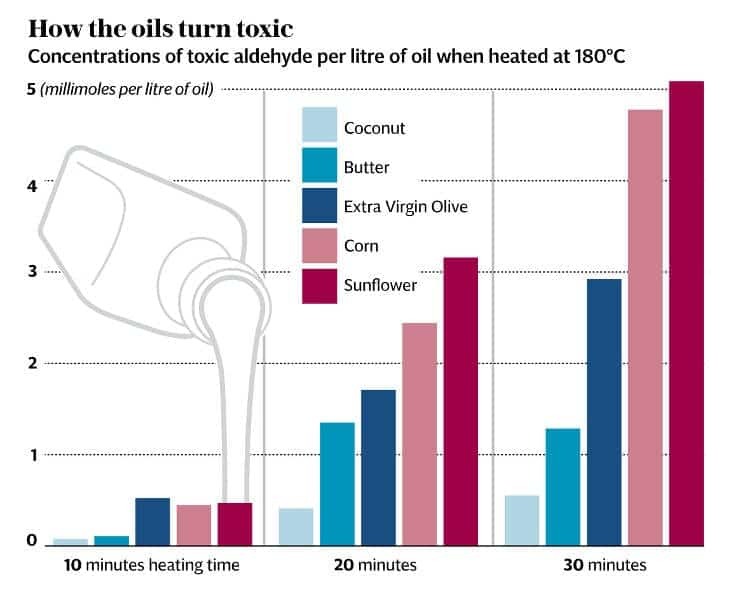 Heating polyunsaturated vegetable oils for just 20 minutes produces 20 times the permitted levels of aldehydes recommended as a maximum limit by the World Health Organization . Keep in mind that at fast-food restaurants and in the preparation of commercial donuts and other fried food products, these industrial seed oils are used for frying everything from French fries to donuts and are heated over and over for extended periods of time, creating alarming levels of aldehydes and lipid peroxidation products. When heated, industrial seed oils produce oxidized metabolites known as oxidized linoleic acid metabolites (OXLAMs) which have been also been implicated in the development of non-alcoholic fatty liver disease (NAFLD). 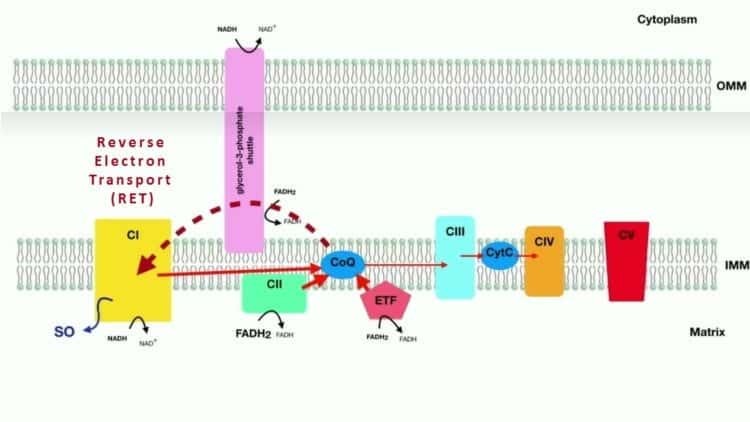 In the body cell components such as cardioleptin with high amounts of linoleic acid are easily oxidized producing an oxidation product known as 4-hydroxynonenal (4-HNE) which has been implicated in the development of cancer . The high linoleic acid content of industrial seed oils also act on two endo-cannibinoids in the body (2-AG and Anandamide) which results in us feeling hungry, even when we have recently eaten – in much the same way as cannabis (marijuana) does [11-12]. As a result, these industrial seed oils are believed to contribute to obesity and the associated health risks such as Type 2 Diabetes and high blood pressure. For fifty years, the public ate industrially-created trans fats in place of natural saturated fats and we only found out later that they were a major contributor to heart disease. For the last forty years we have been eating industrial seed oils in greater and greater quantities place of natural saturated fat, but (a) given how these industrial seed oils are produced (solvents, high heats for extended period of time, bleach, etc.) and (b) given what is known about the very toxic products they produce when heated in production and how they are oxidized in the body and oxidized through heating when cooking, it is warranted to be very cautious about eating prepared foods made with them. To avoid these industrial seed oils will take a concerted effort as they are in virtually everything we buy ready-made and many of the foods we eat out, but one solution is to cook real food using healthy sources of fat and to avoid these industrial seed oils that were created and marketed to us as supposedly healthy substitutes for natural fats. The butter, lard and tallow of years gone by were made from animals that were pasture raised, not fed soybeans and corn as commercial animals are now, but in light of the mounting number of studies that indicate that saturated fat is not associated with increased risk of cardiovascular disease, perhaps it might be preferable to buy grass fed butter or render tallow or lard from the fat of pasture-raised animals for some cooking applications – rather than use these industrial seed oils that were created as substitutes. Butter, lard and coconut oil (a vegetarian saturated fat) are all very low in linoleic acid and thus are very stable. They are not easily oxidized in the body or by heating and produce very low levels of aldehyde and lipid peroxidation products when heated, compared with many of the industrial seed oils. These are all factors we need to consider when deciding which fats our food should be made with. 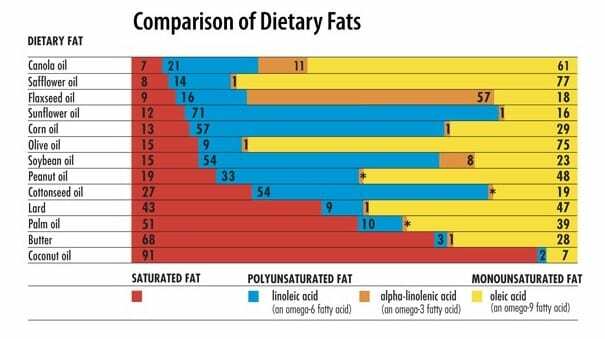 The chart below shows the linoleic content of some common fats in blue. Keep in mind that fats with the smallest amount of linoleic acid are the most stable and the least prone to oxidation (either in the body or when heated). A personal note: For non-heating uses, I use natural sources of monounsaturated fat such as cold pressed macadamia nut oil, hazelnut oil, avocado oil, and extra virgin olive oil and for cooking and heating uses I use a mixture of olive oil and coconut oil (to raise the smoke point), clarified butter (ghee) at higher temperatures and butter at lower temperatures and for baking. I read labels of all products I buy and deliberately avoid purchasing any food products that contain soybean oil, canola oil or sunflower oil and when I eat out, I ask that my food be prepared with coconut oil, butter or ghee. While the jury is still “out” when in comes to saturated fat, it is my opinion that with the mounting evidence that eating saturated fat does not contribute to heart disease, using moderate use of butter, ghee (clarified butter) and coconut oil seems to me to be a more acceptable risk than eating foods made with, or fried in industrial seed oils. I trust having the information contained in this article will help you make an informed choice for yourself and for those you cook for. If you have questions about how I might be able to help you follow a low carb lifestyle -including selecting appropriate fats for use in your own cooking, please feel free to send me a note using the “Contact Me” form located on the tab above. 7. Tanya L Blasbalg, Joseph R Hibbeln, Christopher E Ramsden, Sharon F Majchrzak, Robert R Rawlings; Changes in consumption of omega-3 and omega-6 fatty acids in the United States during the 20th century, The American Journal of Clinical Nutrition, Volume 93, Issue 5, 1 May 2011, Pages 950–962. 9. Maciejewska, Dominika & Ossowski, Piotr & Drozd, Arleta & Karina, Ryterska & Dominika, Jamioł & Banaszczak, Marcin & Małgorzata, Kaczorowska & Sabinicz, Anna & Wyszomirska, Joanna & Stachowska, Ewa. (2015). Metabolites of arachidonic acid and linoleic acid in early stages of non-alcoholic fatty liver disease-A pilot study. Prostaglandins & other lipid mediators. 10. Zhong H, Yin H. Role of lipid peroxidation derived 4-hydroxynonenal (4-HNE) in cancer: Focusing on mitochondria. Redox Biology. 2015;4:193-199. doi:10.1016/j.redox.2014.12.011. INTRODUCTION: Both the US and Canadian Dietary Guidelines encourage us to limit saturated fat in order to reduce the risk of heart disease and to eat unsaturated fat, including polyunsaturated fats and oils instead but what are these fats, where do they come from and what role might these play in development of obesity, Type 2 Diabetes, non-alcoholic fatty liver disease and even cancer? This article is part 3 in the series titled Bad Fats and Enduring Beliefs. Part 1 titled the Vilification of Saturated Fat can be read here and Part 2 titled Saturated Fat and Heart Disease can be read here. “Polyunsaturated vegetable oils” is really a misnomer, as neither soybeans nor rapeseed / Canola are “vegetables”. More accurately these should be called “industrial seed oils”, as they are seed crops that have been deliberately engineered for food use. These are created oil products which are quite unlike natural oils that can be easily expressed from nuts, seeds and fruit using a millstone, as has been done since the Bronze Age . If you simply press olives, almonds, sesame or poppy seeds between your fingers you will be able to express a little bit of their oil on your fingers. You can squeeze a soybean as hard as you like and for as long as you like and you are not going to get any oil out of it! The first attempt at trying to express oil from soybeans occurred in the United States, a few years after the creation of Crisco® shortening in 1911. For 3 long years (1922 – 1925) scientists tried over and over again to extract oil from soybeans imported from Manchuria using hydraulic presses, and time and time again they failed. Finally, in 1925 scientists turned to the use of chemical solvents to get oil from soybeans and solvent extraction of soybean oil has been used ever since. In days gone by, deep-fat frying in restaurants (e.g. for French fries) was done in beef tallow, sometimes in lard. 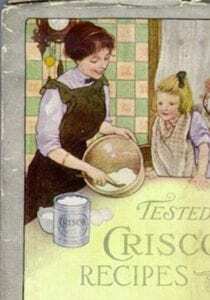 Pastry crusts were made with lard or butter, and baked goods such as cakes and brioches were usually made with butter – that is until 1911 when Crisco® shortening was invented. When it was noticed that hardened cottonseed oil used in the soap-making industry had an appearance like lard, scientists decided to further process it to remove the strong odor inherent with cottonseed oil, and market it to housewives as the ‘modern’ way to bake. You can read more about that here. Beginning in the 1950s, trans fats (which occurs naturally in very small quantities) were industrially produced from other industrial seed oils such as soybean oil for use in other natural fat substitutes, including margarine, fat for commercial baked goods and fat for deep-fat frying in the fast food industry . Unfortunately, it was only in the late 1990s and early 2000s that it became widely-accepted by the scientific community that eating foods made with trans fats or fried in trans fats raised LDL-cholesterol while lowering protective HDL cholesterol, and also raised triglycerides; promoting systemic inflammation and contributing to the development of heart disease. How ironic that the fats that were created to replace naturally-occurring saturated fats ended up being so detrimental to health! After trans fats were discontinued due to their adverse health effects, industrial seed oils such as soybean oil and canola oil became the number one and number two oils of the food industry. These unsaturated (liquid) industrial seed oils have replaced saturated (solid) trans fat industrial oils in our food supply, however there is considerable evidence emerging which should cause us to question whether these fats are any safer (more on that below). The market for industrial trans fats and liquid industrial seed oils was itself created based a belief that ‘dietary saturated fat led to heart disease’. Much of what we have come to believe about this originated with a pathologist named Ancel Keys who proposed his ‘diet-heart hypothesis’ in the 1950s. In 1970, Keys published his “Seven Country Study” that reported that populations that consumed large amounts of saturated fats in meat and dairy had high levels of heart disease but when data from 22 countries that was available since 1957 was plotted, it was a great deal more scattered, indicating a much weaker association than Keys’ Seven Country Study data indicated. 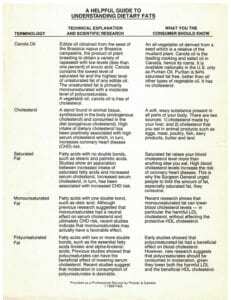 In August of 1967, Stare, Hegsted and McGandy, 3 Harvard researchers paid by the sugar industry published their reviews in the New England Journal of Medicine which vindicated sugar as a contributor of heart disease and laid the blame on dietary fat and in particular, saturated fat and dietary cholesterol (previous article on that topic here). Sponsorship of this research by the sugar industry certainly casts a dark shadow over their findings. These 3 researchers insisted in their conclusion that there was a link between dietary cholesterol and heart disease and that there was “major evidence” which suggested that there was “only one avenue for diet to contribute to hardening of the arteries and the development of heart disease”, but as covered in the previous article, it is known that a year after their publications (1968), the report of the Diet-Heart Review Panel of the National Heart Institute made the recommendation that a major study be conducted to determine whether changes in dietary fat intake prevented heart disease because such a study had not yet been done. Just 10 years after the sugar industry paid Stare, Hegsted and McGandy to write their reviews, Hegsted was directly involved with developing and editing the 1977 US Dietary Guidelines which recommended that Americans decrease intake of saturated fat and cholesterol and increase dietary carbohydrate – entrenching the belief that saturated fat caused heart disease into American public health policy. 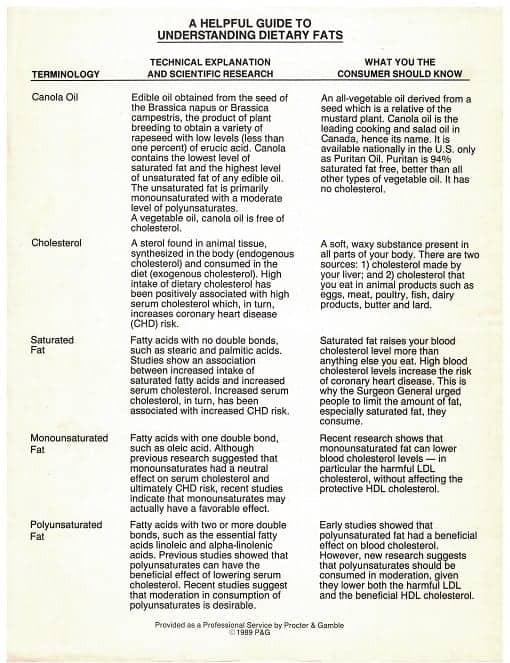 That same year (1977), based on the same body of literature, Canada adopted very similar dietary guidelines around saturated fat…and the rest is history. 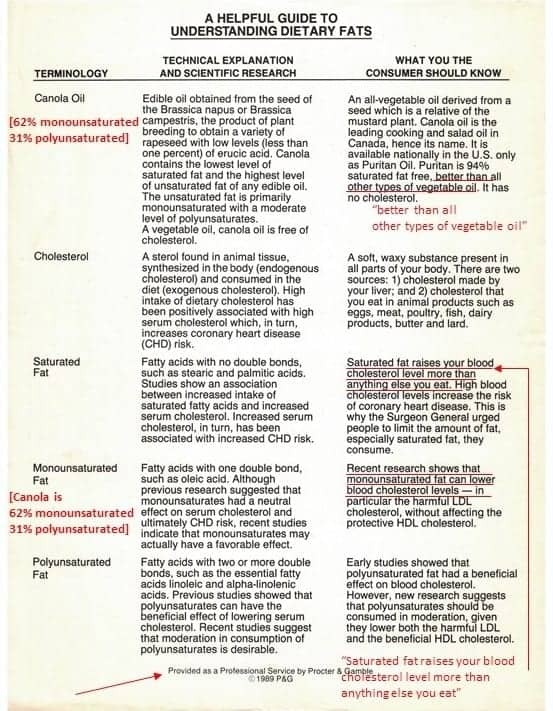 For the last forty years Americans and Canadians have shunned natural fats such as butter, cream and lard in place of man-made margarine, non-dairy creamer and Crisco® – all in the enduring belief that ‘saturated fat is “bad” and leads to heart disease’. 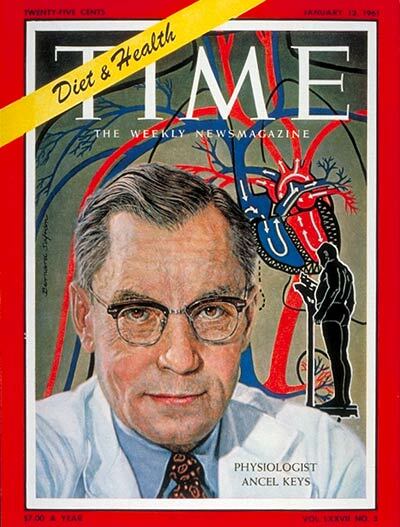 Given that published reports vilifying saturated fat were funded by the sugar industry and that Ancel Keys study left out 2/3 of the nutrition and health data available at the time, it has become evident that public health policy was founded on what is now questionable data. In addition, more and more current peer-reviewed published studies are concluding that saturated fat is not associated with an increased risk of developing cardiovascular disease. In the recent article titled Saturated Fat and Heart Disease, I outlined the findings of 8 recent meta-studies and systematic reviews and one worldwide epidemiological study which call into question the enduring belief that dietary saturated fat increases the risk of developing heart disease. In a follow up to the above article, titled More Animal Fat Consumption Less Cardiovascular Disease, I also summarize the findings of a newly published worldwide study which found that total fat and animal fat consumption were least associated with the risk of cardiovascular disease. If saturated fat is not associated with increased risk of heart disease then should we be eating industrial seed oils that were created and marketed as a replacement for them? Inexpensive soybean oil has been the leading oil used in food production in the United States since 1945 . It was previously made into a hard fat through hydrogenation and sold to consumers as trans-fat based shortening and margarine and came into wide-spread use as both synthetic hard fat and as a food-based oil product in the late-1960s. In Canada, soybean oil is just behind canola oil in terms of the most used, and canola is another industrial seed oil that was created by science. In 1978 rapeseed, a prairie weed was specially bred in Canada to produce a novel plant that was lower in erucic acid (a toxin found in rapeseed) and this new plant was named “canola” (‘Canadian Oil’). A 2015 study on Canadian vegetable oil purchased and eaten in Canada found that in 2013, 42% was canola oil (a Canadian bio-engineered industrial seed oil) and 20% was soybean oil, an industrially-engineered seed oil developed in the US . Keep in mind this figure excludes food products available in Canada that are manufactured in the US, which uses predominantly soybean oil. According to an article titled “Soybeans Are Ancient; Oil Is Not” published in the Wall Street Journal in 2011 , soybeans as the basis for tofu and soy sauce is an ancient food in China, but soybean oil was virtually unknown until global food oil shortages during World War I created an interest to extract the fatty part of the soybean for oil. Soybean oil is a modern creation. How is oil made from seeds such as soybean and canola? 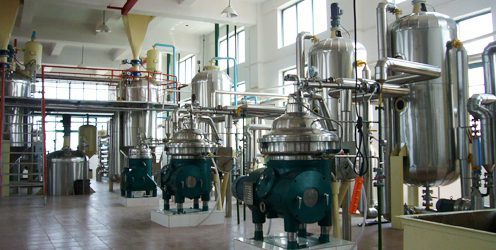 The extraction of soybean oil involves the industrial processing of soybeans with solvents at very high heats over an extended length of time in order to have the soybean give up its small amount of oil. Yummy! Now this oil is ready to sell to the public to cook with and eat! Should we even be eating these industrial seed oils? Are they any safer than trans fats that were approved for consumption for 50 years and later found to contribute to heart disease? Part 2 of this article will continue in Concerns with Polyunsaturated Vegetable Oils – Part 2. Alfred Thomas (2002). 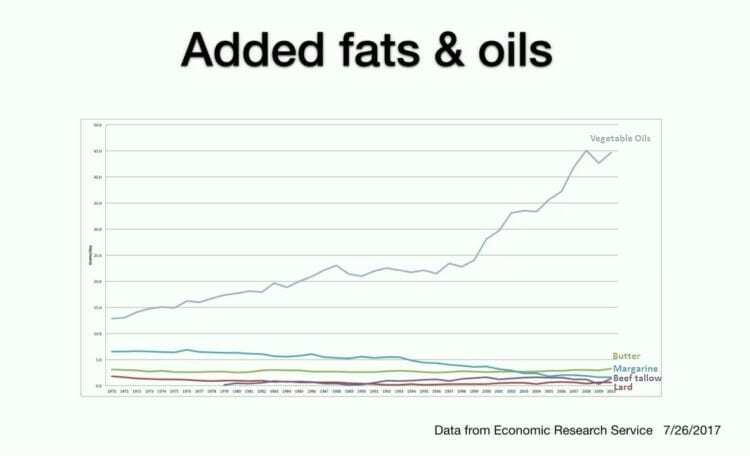 “Fats and Fatty Oils”. Ullmann’s Encyclopedia of Industrial Chemistry. Weinheim: Wiley-VCH. “Tentative Determination Regarding Partially Hydrogenated Oils”. Federal Register. 8 November 2013. 2013-26854, Vol. 78, No. 217. Special thanks to Tucker Goodrich for getting me thinking in this regard. This content of this post is based largely on a presentation titled “A New Hypothesis for Obesity” given by Dr. Michael Eades at the Low Carb Breckenridge Conference, Breckenridge Colorado, Sunday, March 4, 2018 with some details filled in from his website. 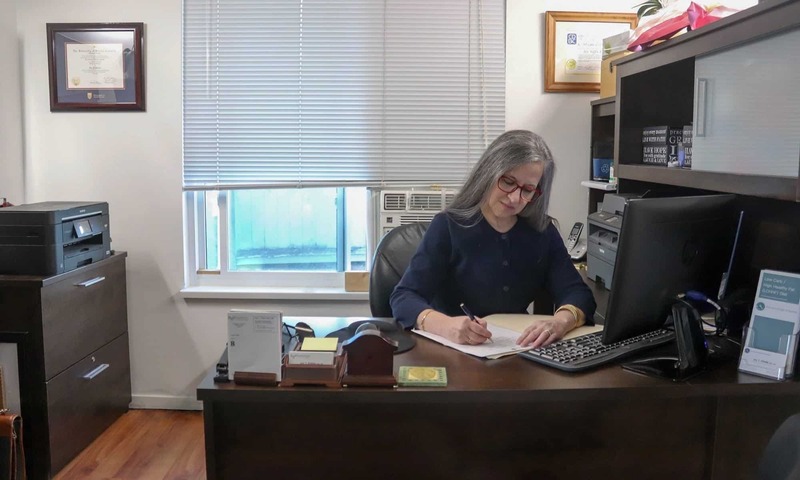 Dr. Eades has been in full time practice of bariatric, nutritional and metabolic medicine since 1986 and is the Director of Medi-Stat Medical Clinics, a chain of ambulatory out-patient family care clinics in central Arkansas. I have added the Canadian data for the benefit of my readers. This article is Part 2 in the two-part series The Evolving Hypothesis of Obesity. Part 1, which lays the groundwork for this article can be read here. In the 1970’s the Dietary Guidelines in both the US and Canada advised us to eat more grains, vegetables and fruit and to eat vegetable fat, instead of saturated fat in butter, eggs, whole milk and red meat. In 2016, per capita consumption of beef, pork, lamb and veal in Canada was 47.7 kg (105 lbs) per person per year down from the 73.2 (161 lbs) per person per year it was in 1980. Egg consumption also dropped from 21.96 dozen per person per year in 1980 to 19.93 dozen in 2016. The last time it was measured nationally in 2009, total fresh vegetable intake (excluding potatoes) rose to a record 40.7 kg (89.7 lbs) per person and the amount of potatoes including as french fries was 27.9 kg (61.6) per person, making total vegetable consumption 68.6 kg (151 lbs) per person per year. Total fresh fruit consumption also rose to a record 39.3 kg per person. The Canadian Canola Growers Association reported that in 2012, 600,000 tonnes of canola oil and soybean oil was consumed by Canadians either as grocery store items or food-service products, including margarine, cooking oil, mayonnaise and salad dressing. In the twelve months ending July 2012, 2.8 million tonnes of Canadian vegetable oil was exported to the US and China, accounting for another 2.4 million tonnes. 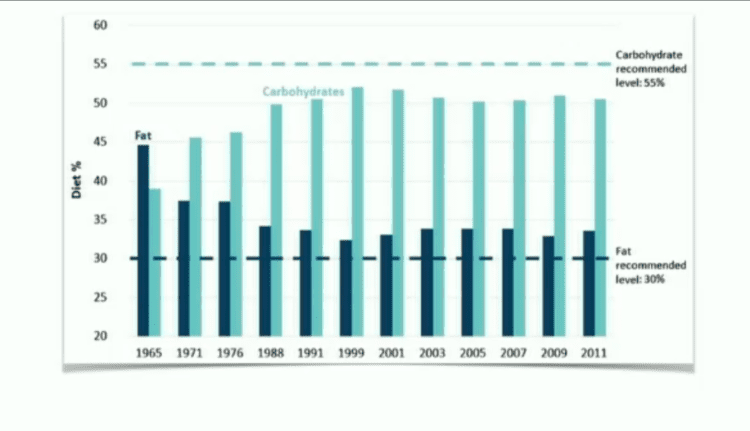 As saturated fat intake has declined, carbohydrate intake has continued to increase from the mid-1960s onward. The most significant change since 1976-1980 is that we are eating a great deal more linoleic acid found in soybean, canola and corn oil while simultaneously eating significantly less saturated fat and overall eating more calories. (3) the increased consumption of refined carbohydrates. Simply put, the evolving hypothesis of obesity states that in addition to the (a) increasing amount of carbohydrate in the diet since ~1980, things are made significantly worse by (b) large amounts of industrially-produced polyunsaturated fats which promote obesity simultaneous to the (c) decrease in naturally occurring saturated fats which protect against obesity. Dr. Eades credits much of the mechanism for the linoleic hypothesis to Dr. Petro Dobromylskyj, whose is a doctor of veterinary medicine and who writes a technical blog called Hyperlipid which I referred to in order to fill out my understanding in writing this article. To understand the mechanism, the only chemistry you need to understand is the difference between a saturated fat and an unsaturated fat. Saturated fats are ones where all the carbons in the chain are saturated with hydrogen atoms and there are no double bonds in the middle of the fatty acid chain. 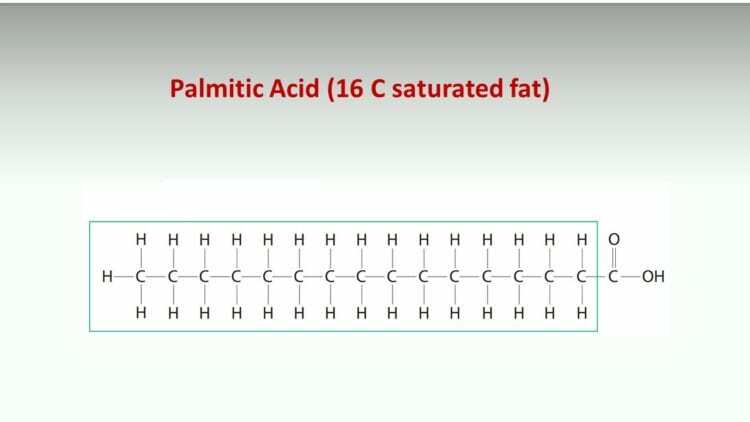 Palmitic acid (a 16 carbon fat) is an example of a saturated fat – and is one that our body synthesizes. When a saturated fat is broken down (called “beta oxidation”), 2 carbons are cleaved off at a time, until the fat is completely broken down. Glucose is processed anaerobically in the cytosol of cell, but fatty acids are metabolized inside organelles called mitochondria (the ‘powerhouse of the cell’). All our food (regardless what it is) is metabolized to a combination of FADH2 and NADH. The NADH and FADH2 enter the Electron Transport Chain at different complexes. 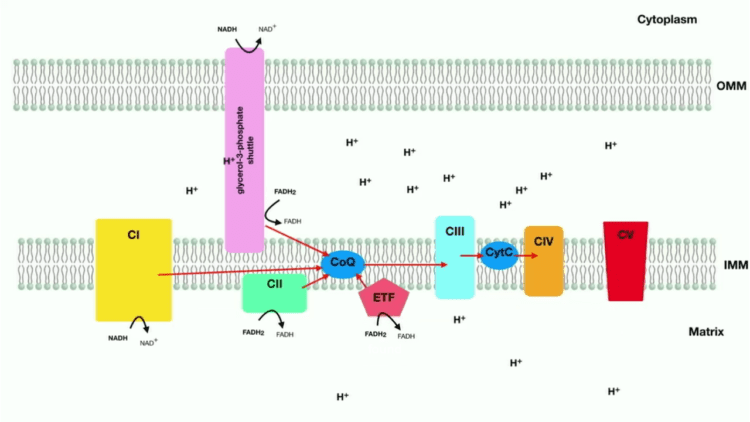 NADH enters at Complex I (CI), while FADH2 enters at Complex II (CII). 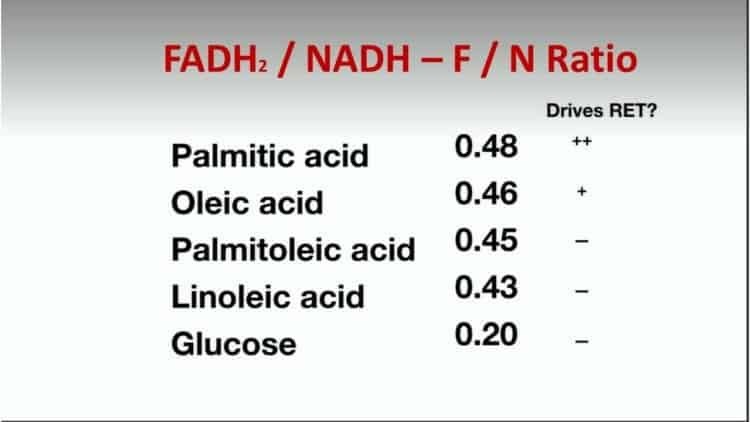 The lower the FADH2:NADH ratio is, the lower the local insulin resistance is and the higher the FADH2:NADH ratio, the higher the local insulin resistance. A saturated fat generates a higher FADH2:NAHD ratio, so saturated fat increases local insulin resistance which serves to keeps more carbs in the blood. A process called Reverse Electron Transport is initiated which results in the making of a signalling molecule known as a superoxide (SO) molecule. This signalling molecule tells the body to stop insulin signalling by inducing local insulin resistance. This way, the cell doesn’t take up too much energy. 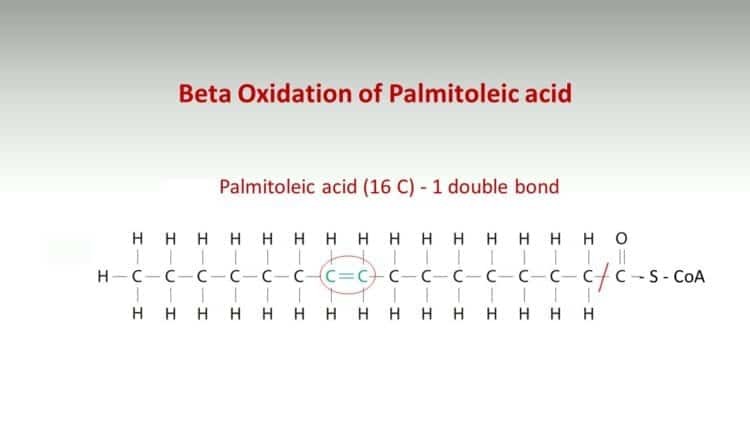 An unsaturated fat, on the other hand (such as palmitoleic acid or linoleic acid) has double bonds in the middle of the chain which changes the way the body processes it. When fat cells (and other cells) are metabolizing an unsaturated polyunsaturated fat (PUFA) such linleoic acid from soybean oil, corn oil or canola oil, they generates a lower FADH2:NAHD ratio, so an unsaturated fat reduces local insulin resistance, which means they allow plenty of glucose into the cells along with the PUFA. These n-6 PUFAs generate energy all the way through the Electron Transport Chain and the Reverse Electron Transport is not triggered, so NO (superoxide) signalling molecule to tell the body to stop insulin signalling (i.e. there is no localized insulin resistance caused). The cell just keeps taking in more and more energy even though it doesn’t need any more! This means the fat gets driven into the fat cells and is stored there, making it unavailable for use for energy. Once fat gets stored in the fat cells, the body can only break it down when no more energy is coming in (such as when fasting), so the only way the body can get more energy is to eat more. The glucose is driven into the cells because of the decreased insulin resistance caused by the n-6 PUFAs oils, which results in glucose level falling. This causes the body to produce a strong signal to eat; in other words, it makes you hungry. 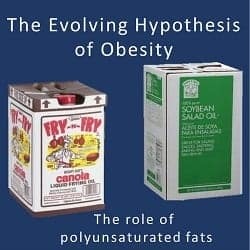 Along with carbohydrates, n-6 PUFA vegetable oils have increased dramatically in the typical American and Canadian diet since the 1970s and this mechanism explains why we've been getting fatter and fatter since then. So much of our eating now takes place away from home, or with food made away from home, that much of the fat intake in the diet is n-6 PUFA vegetable oils that signal glucose to come right in along with them. 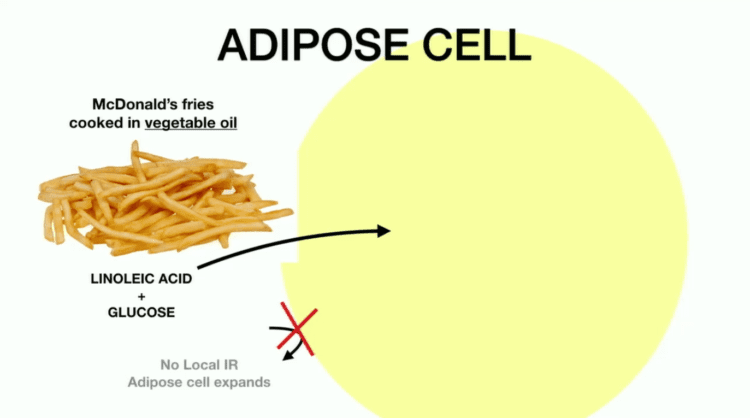 In the 1960’s French fries were fried in beef tallow (which is a saturated fat), and the stearic acid from the beef fat and the glucose (from the broken down potato) would be processed by the fat cell (adipocyte). When the cell had enough energy, Reverse Electron Transport would kick in and create the signalling molecule (superoxide molecule), which would tell the body that it didn’t need any more energy. This would result in a decrease in hunger and an increase in energy expenditure. Think of the superoxide molecule as a “bouncer” at a night club. When there are enough people inside, the “bouncer” simply won’t admit any more people until some leave. When French fries are fried in polyunsaturated vegetables oil, the linoleoic acid (from the soybean oil or canola oil) and glucose (from the broken down potato) are processed by the fat cell. The problem is, that even when the cell has more than enough energy, Reverse Electron Transport does NOT kick in and there is NO signalling molecule (superoxide) produced. The body doesn’t get any message that it doesn’t need any more energy, and the person doesn’t get any signal that they’re full, so they just keep eating. In the case of eating foods made with polyunsaturated fat, it would be like a night club that has no “bouncer”. Even when the club is jam-packed with people, everybody is admitted until there is no room to move! Fat cells (adipocytes) bind more insulin at a given level of exposure when eating polyunsaturated fats such as soybean oil, canola oil and corn oil, than fat cells bind when eating saturated fat such as butter, lard or beef tallow. Since insulin has to bind to its receptor to work and more insulin is bound when eating a diet rich in polyunsaturated fats, significantly more glucose is taken up into a fat cell in a diet high in polyunsaturated fats than in a diet rich in saturated fat. That is, the cells are more sensitive to insulin when eating a diet rich in polyunsaturated fats than a diet rich in saturated fat, so polyunsaturated fats allow too much glucose in to cells. When fat cells and other cells are metabolizing saturated fat they make a superoxide (SO) molecule as a result of Reverse Electron Transport which is used to stop insulin signalling. When fat cells and other cells are metabolizing polyunsaturated fats, there is NO Reverse Electron Transport, so they are unable to generate the superoxide molecule that is needed to stop insulin signalling. This is because there is too little FADH2 being delivered to ETF. 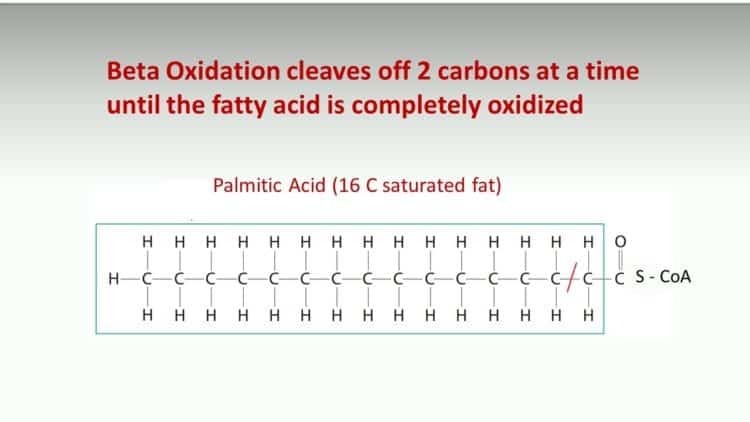 Saturated fats, such as Palmitic acid have a higher FADH2: NADH ratio and it is believed that this is what drives Reverse Electron Transport (RET). Oleic acid, the monounsaturated fat found in olive oil drives Reverse Electron Transport (RET) somewhat, but to a lesser degree than a saturated fat. Unsaturated polyunsaturated fats such as Linoleic acid (found in soybean oil, corn oil and canola oil) have too small a FADH2: NADH ratio which prevents it from initiating Reverse Electron Transport (RET). It is thought that because polyunsaturated fats have such a low FADH2: NADH ratio, they are treated by the body similarly to glucose. There are two consequences to eating fats with this low FADH2: NADH ratio. When these fat cells get over-full they are unable to keep the fat contained as they should, and as a result free fatty acids are released and eventually find their way into other places where fat is not supposed to be found, such as in the liver, pancreas, even muscle and bone cells. This is known as ectopic fat and the condition that results is called metabolic syndrome. What happened after the 1950s and 1960s that caused overweight and obesity to suddenly explode in the 1970’s – and just keep rising? The answer is the types of fat we started eating. 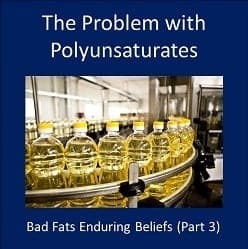 Even though we were eating the same total amount of fat as before, these new industrially-produced polyunsaturated fats (such as soybean oil, canola oil and corn oil) do NOT provide the feedback mechanism that natural fats (such as butter, lard and beef tallow) do, so there is nothing in these manufactured fats to signal us that we are “full”. This is why we began eating 240 more calories per day in carbohydrates –because the polyunsaturated fat that accompanied the carbs don’t tell us we’ve had enough! The (1) the vilification of saturated fat, the (2) encouragement to eat and our acceptance and adoption of industrially produced vegetable oils and the (3) increased consumption of refined carbohydrates created the “perfect storm” and which taken together, certainly provide a reasonable mechanism with explains the massive increase in obesity from 1980 until the present. 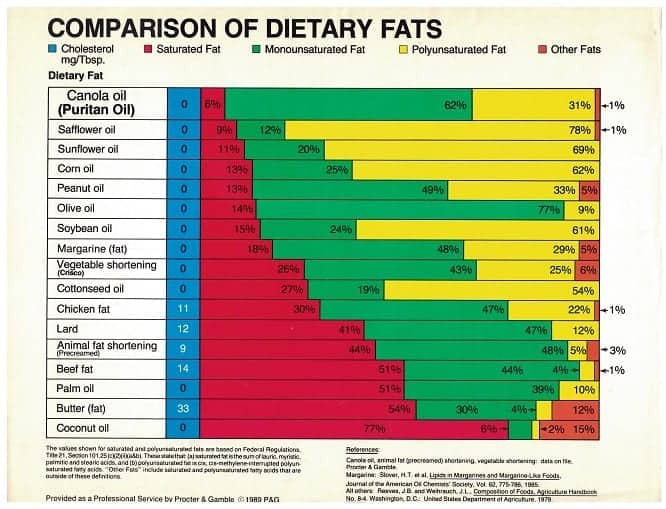 The different way the body processes natural saturated fats (such as butter, lard and beef tallow) versus the way it processes industrially-produced polyunsaturated fats (such as soybean oil, canola oil and corn oil) explains the mechanism by which the prevalence of obesity graph so closely mirrors the consumption of vegetable oil graph. 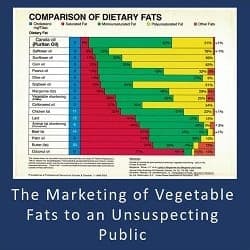 Given that (1) total fat consumption has not changed since the 1960’s, only the type of fat we are eating has and (2) given that the body manufactures saturated fat in the form of palmitate, these naturally occurring saturated fats should not be thought of as “dangerous” or to underlie obesity. As occurred late in the game with trans fats, it is time that these industrially-produced polyunsaturated fats be examined much more closely. We ought to ask ourselves if we should even be eating oil from crops not thought of as fat-containing. If we squeeze an olive and fat comes out or we crush a nut and oil comes out, these are natural fats. Fats such as cold pressed olive oil, macadamia nut oil and walnut oil (to name a few) are natural sources of largely monounsaturated fats that are foods our ancestors (or other people’s ancestors) knew. If “oil” needs to be produced under high pressure, high heat and with the use of solvents and deodorizers, is this even “food”? I think not. Want to understand how to best nourish your body explained by someone who can make the science simple? Please feel free to send me a note using the “Contact Me” form above. This content of much this post is based on a presentation titled “A New Hypothesis for Obesity” given by Dr. Michael Eades at the Low Carb Breckenridge Conference, Breckenridge Colorado, Sunday, March 4, 2018. Dr. Eades has been in full time practice of bariatric, nutritional and metabolic medicine since 1986 and is the Director of Medi-Stat Medical Clinics, a chain of ambulatory out-patient family care clinics in central Arkansas. I have added Canadian data and photos for Canadian readers. This article is Part 1 of two on The Evolving Hypothesis of Obesity. The current ‘obesity epidemic’ is often understood in terms of the change in the percentage of obese people in the US or Canada from the early 1950’s, through the early 1970s until today. In Canada in the early 1960s the obesity rates were 10.2% (~8% of men and ~12% of women) and in the US, obesity rates at that time were 10.7%. From 2007 to 2009, obesity in Canada rose to 24.1% and in the US, rose even more to 34.4%. In addition to statistics, another way to understand the obesity epidemic is through historical photos. 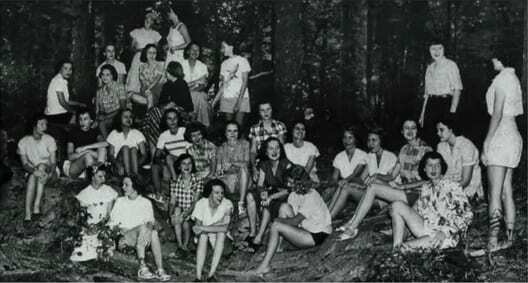 Below is a sorority photo from Louisiana from the 1950s (one of the US States that currently has one of the highest rates of obesity). 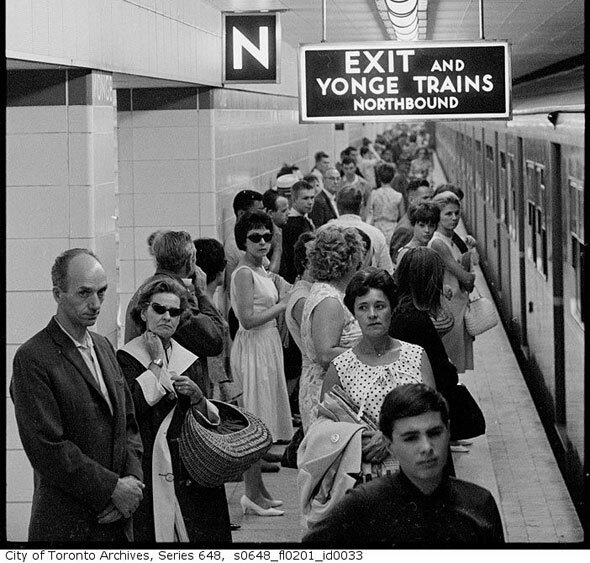 Here’s a photo of what people looked like in 1967, riding the subway in Toronto. 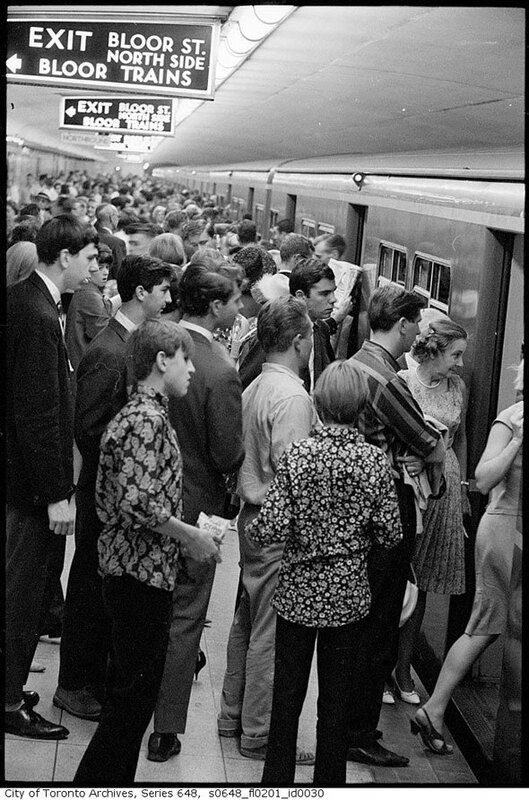 As can be seen in another photo (below) from a Toronto rush hour, young adults, middle aged adults and older people were very slim compared to today’s standards. In the 1950’s, people in US as in Canada ate carbohydrates at each meal. They ate cereal or toast for breakfast and just about every household had a toaster. Lunch was often sandwiches, as there were no microwaves to heat food up in. Potatoes were a mainstay at dinner, sometimes pasta – yet the majority of young adults and adults were slim. Of course there were always some people that were overweight. Most elementary school classes had one ‘chubby’ kid, but when one looks around the classes of today or on public transit or in stores and supermarkets, most people are considerably heavier than people in the 1950’s and 1960’s. What caused overweight and obesity to all of a sudden explode in the 1970’s – and just keep rising? A clue is in the macronutrient intake between 1971 and 2010. The graph on the left above shows macronutrients (protein, fat and carbohydrate) as a percentage of calories. 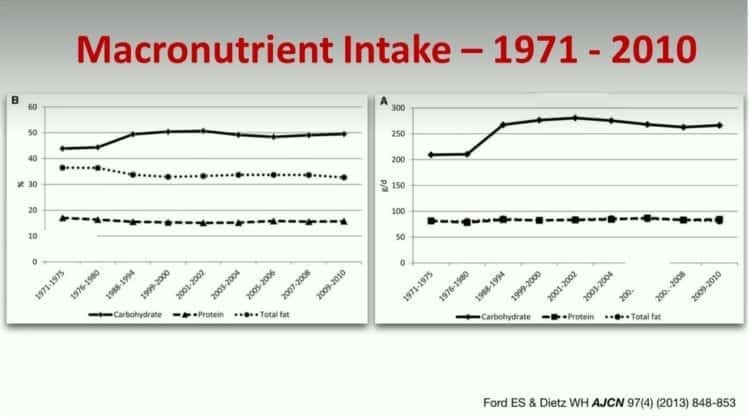 After 1980, carbohydrate intake went up, fat intake went down and protein remained about the same. As carbs intake went up and fat went down (protein intake stayed about the same), people began to gain weight. But what caused people to start eating more carbs? The graph on the right above is much more telling as it shows the macronutrient intake in grams eaten per person per day. There are only two lines on the graph because the amount of fat and the amount of protein are superimposed over each other and appear as one line. The amount of fat (in grams) and the amount of protein (in grams) is approximately 75 g each however keep in mind that fat has 9 calories per gram and protein only has 4 calories per gram. The top line on the graph shows carbohydrate intake in grams and as can be seen around ~1976-1980 carbohydrate intake suddenly skyrocketed by ~ 240 calories per day. What made people start eating 240 calories more per day in carbohydrate? More on this in Part 2, but the clue is in the type of fat that people began to eat. The graph below shows the change in the type of fat that people ate from 1970 to 2010. While the total amount of fat remained relatively constant from 1970 – 2010, there was a significant change in the type of fat that people ate. From 1970 onward, there is a huge increase in the consumption of polyunsaturated vegetable oils. 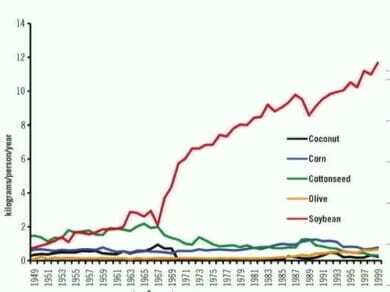 Breaking these vegetable oils down into specific types of oils, one can see that there is a huge increase in the consumption of soybean oil over this period. Where does good old Canadian “canola oil” place? 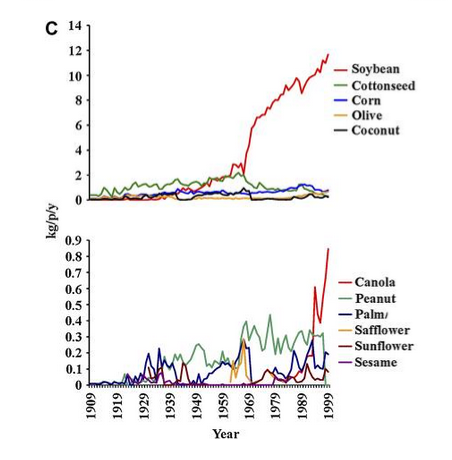 The graph at the top of the illustration below is the same graph as the one above and shows that soybean oil consumption reaches 12 kg per person per year. Looking at the graph below that one, canola oil is less than 1 kg per person per year. It’s important to remember that the per person consumption of these oils is not only the fats that people buy and use at home, but include the oils used in the food that people eat at restaurants and in pre-made foods, including baked goods. Most oils sold as “vegetable oil” are soybean oil and it finds its way into things we’d never expect to find it in. Read labels more closely and you’ll find it everywhere. It’s in peanut butter and infant formula, most commercial salad dressings, crackers and baked goods, such as muffins. Its what your mayonnaise is made of (even if it says that its “olive oil mayonnaise”) because soybean oil can turn two ounces of olive oil into 500 ml bottle of ‘olive oil’ mayo or salad dressing. These vegetable oils are what potato chips and tortilla chips are fried in and it’s the fat in almost all commercial bread you eat – from burger buns to wraps. It’s everywhere! While the total amount of fat in the diet hasn’t change over time (1970-2010), the type of fat being eaten is very different! We’re eating MUCH more vegetable oils just as the Dietary Guidelines in Canada and the US have encouraged us to do since the 1970s and at the same time, we’re eating less saturated fat from beef, pork, eggs, butter etc. As will be developed in the second part of this article, this increase in the consumption of vegetable oils and decrease in eating saturated fat has served as two sides of a dual-edged sword that has contributed to the obesity epidemic. One of the reasons for the huge increase in the consumption of vegetable oils is the number of meals that are eaten away from home, as opposed to cooked at home. In the 1950’s and 1960’s people rarely ate out at restaurants unless there was a special occasion, or they were travelling away from home. Meals at home were cooked from scratch (there were very few ‘convenience foods’) and before the creation of vegetable shortening (Crisco®) people used lard (a saturated fat) in their pies and butter in their cakes. Butter (also a saturated fat) was the used on potatoes and as a spread on bread but with the rationing during World War II, margarine came into use – as did vegetable shortening, which was inadvertently created when extracting fats for the industrial production of soap. Restaurants in the 1950s and 1960s used either beef tallow or lard in their deep fat fryers, but with the change in the Dietary Guidelines in the 1970s which told us ‘saturated fat was bad for our health’, these natural fats were replaced with industrially produced soybean oil and canola oil which are extracted under high heat and pressure, with the use of solvents, bleaches and deodorizers. Note: you can squeeze a soybean all day long and you're not going to get any 'oil' out of it - same with a corn kernel or canola (rapeseed). Gently pressing olives or nuts between one's fingers will extract some oil so one can easily see that these are rich sources of fat. Soybeans, corn and canola require hours of industrial processing (heat, pressure and solvents) to extract 'oil'. It has long been known that polyunsaturated omega-6 fats compete for binding sites with anti-inflammatory omega-3 fats (from fatty fish and flax seed) and as a result PUFA oils such as soybean oil, corn oil and canola oil promote inflammation in the body. Approximately 1/2 of meals now are eaten away from home. These could be grabbing a coffee and a pastry at Starbucks® or Tim Hortons®, eating lunch at the work or school cafeteria or picking up ready-made sandwiches at a grocery store. Of course, this amount includes order in pizza and Chinese food, a quick bowl of Pho and any number of snacks bought away from home. The issue with these is the fat used in cooking these foods is now out of our control. Most often, soybean oil is used and behind that, canola. Let’s take a closer look at these vegetable oils. 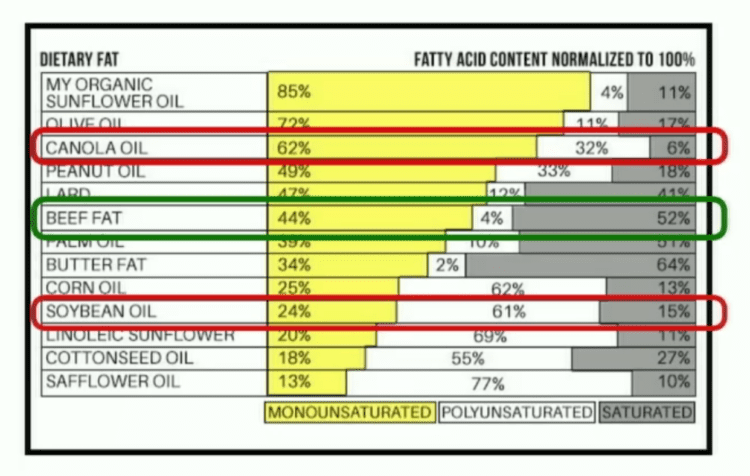 As can be seen from this chart, canola oil is 32% polyunsaturated fatty acids (PUFAs), soybean oil is 61% polyunsaturated fatty acids and beef tallow is only 4% polyunsaturated fatty acids. The issue with oils (which will be presented in part 2 of this article) is that canola oil and soybean oil are very high in linoleic acid. 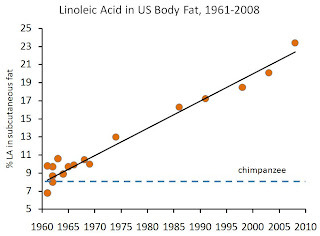 Reflective of the linoleic content of our diet is that the linoleic acid content of human body fat has also increased in a dramatic linear fashion over the last 50 years. The following graph was created by researcher Dr. Stephan Guyenet, PhD (neurobiology) based on various US studies, each of which is represented by an orange dot. This graph indicates that as we’ve been eating a lot more linoleic acid in our diet, this is showing up as an increasing amount of linoleic acid in our bodies. 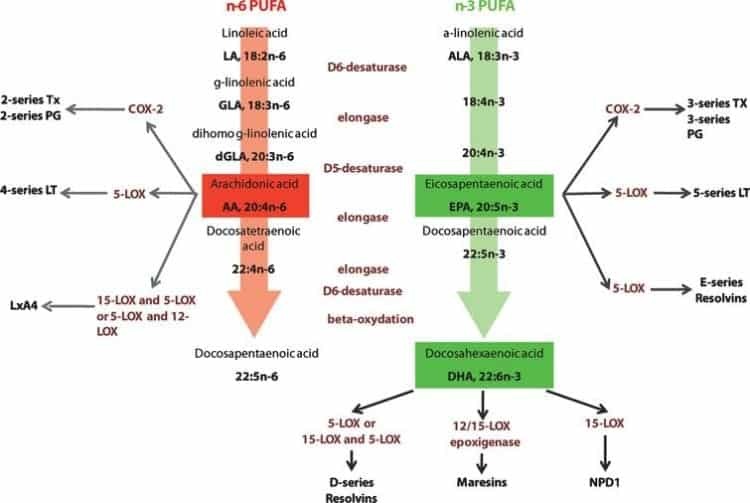 Why these polyunsaturated fatty acids (PUFAs) are being taken up so readily will become clear in Part 2 of this post, which will show the proposed mechanism. 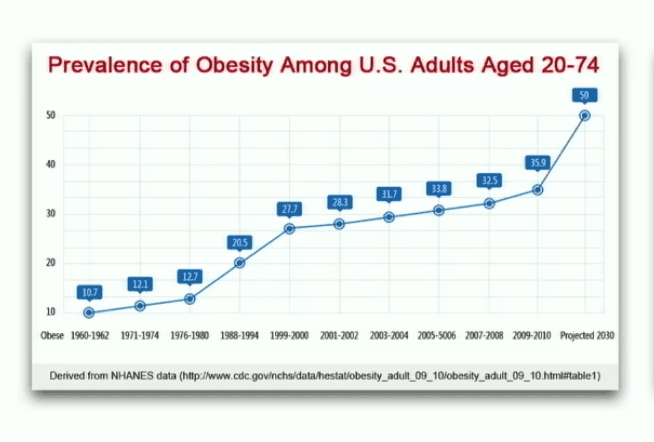 Let’s look at the prevalence of obesity among US adults aged 20-74 from 1960-2010. In 1960-1962, obesity rates in the US were 10.7% which is very comparable to the Canadian obesity rates referred to above. From 2007 to 2009 the prevalence of obesity in the US was 34.4%, which is 10% higher than the obesity rate in Canada which was 24.1%. 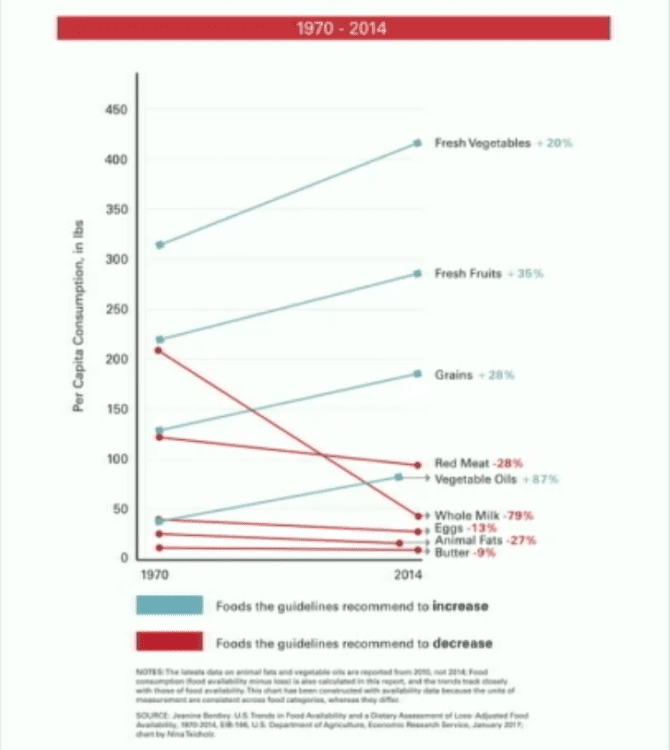 Now let’s compare the above graph on obesity rates to the increased use of vegetable oils over the same period. The parallel rise in the intake of polyunsaturated fats over the same period is striking, and while we know that “correlation is not causation” (i.e. two things being related does not mean that one causes the other) one must wonder if these two factors are related, and if so, how. 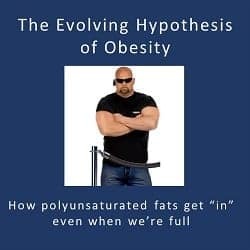 The proposed mechanism between the rise in obesity and the rise in the use of polyunsaturated fats (such as soybean oil, canola oil and corn oil) is covered in Part 2, The Evolving Hypothesis of Obesity – how polyunsaturated fats (PUFAs) make us fat.